Hi everyone! 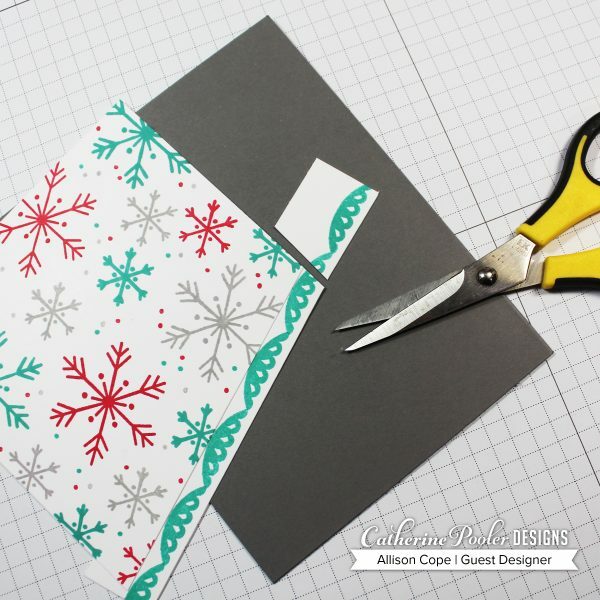 I'm Allison Cope and I'm guest designing on Catherine's blog today! 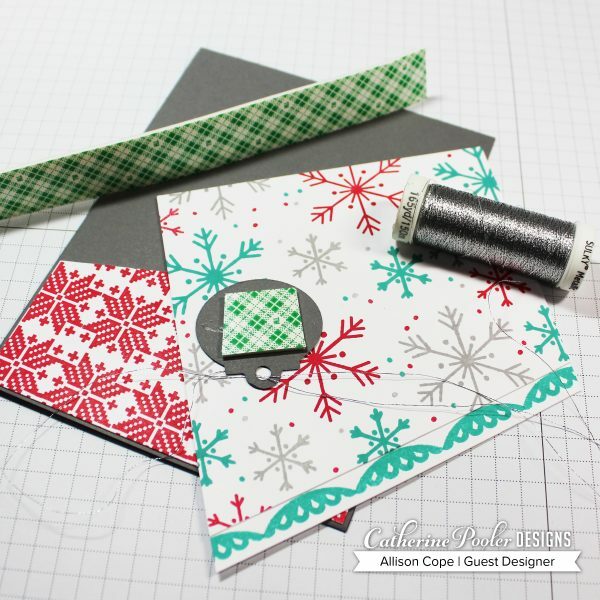 Today I'd thought I'd have some fun with the newest Stamp of Approval collection, “Home for the Holidays”. I just love a non-traditional teal and red color combo for holiday cards so that's where my fun began. 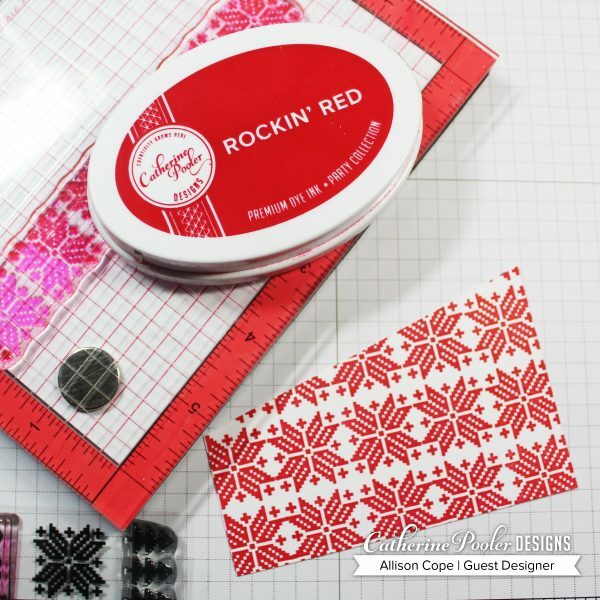 Next I took the remainder of the cut off piece of white cardstock and stamped the sweater knit pattern in Rockin' Red ink vertically up and down. 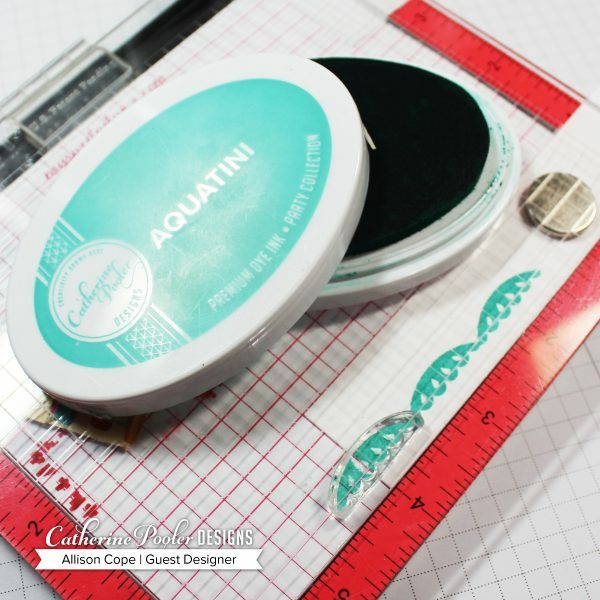 I used my MISTI tool to aid in getting the spacing and stamping nice and crisp and even. 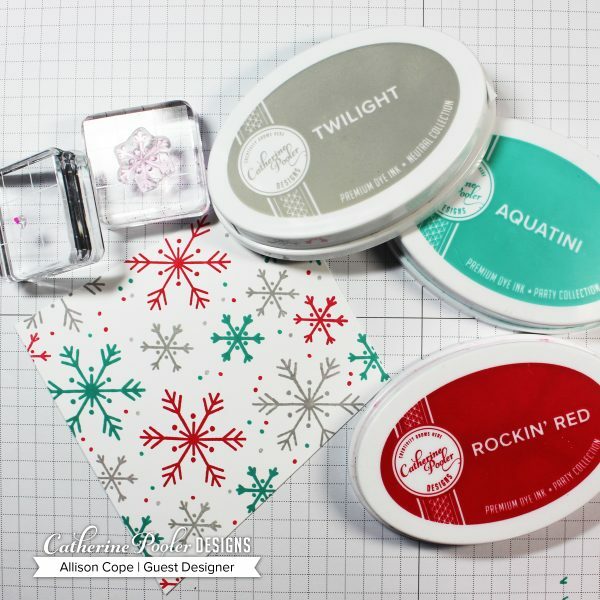 Next I took a strip of cardstock, 1″ x 5″ and stamped a row of the little ornament topper images using Aquatini ink. I trimmed off some of the white cardstock at the bottom of the row once I was done to limit the amount of white that was there. I took the ornament strip and adhered it to the back of my snowflake panel, trimming off the excess. I also created a card base using a piece of the lighter Smoke and Mirrors cardstock by cutting it to 8 ½” x 5 ½”, scoring it at 4 1/4″ and folding it for a side fold card base. I die cut a Tiny Tag from the same grey cardstock. 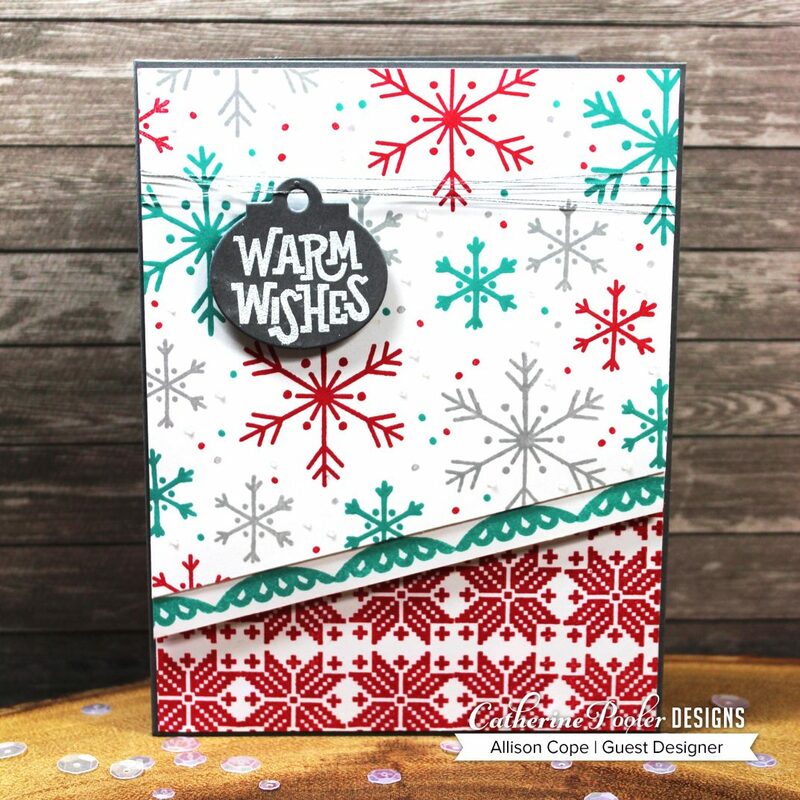 I stamped the “Warm Wishes” sentiment from the Tiny Wishes stamp set with sticky Versamark ink. I added detailed white embossing powder and then heat set it for a slightly raised, shiny greeting. I adhered the smaller sweater knit panel on my card base leaving a small, even border. Then I added some silver thread through the tag hole and adhered it to the snowflake panel with 3 dimensional adhesive. I wrapped additional strands of thread around the snowflake card panel before finally adhering it to the grey card base. And voila… a Christmas card was born! My theory about stamps is that you sometimes have to look at your stamp images with inquisitive eyes. Can you use that image in a new and innovative way; such as how I used the ornament topper image. 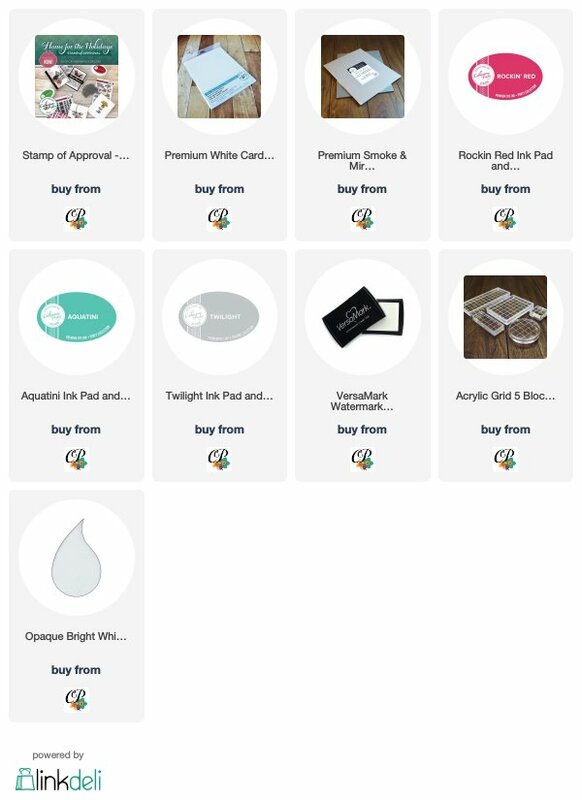 It's extremely fun seeing what you can create with one simple image. I hope I've inspired you to get out your stamps and really take a gander at them today. Try something new! Experiment! Just go get stamping! Enjoy your stamping journey everyone!